The other side of the student housing crisis has been the proliferation of mini-dorms, as students lacking multi-family units on and off campus have been pushed into the neighborhoods. While the council has attempted to alleviate some of the concerns through an increase in supply and has been joined in their efforts by the campus’ commitment to add 9000 beds over the next decade, the council will for the first time take up the issue of mini-dorms directly, at Tuesday’s council meeting. The “City has no authority to deny such a project, or to require adjustments in design to address potential neighborhood concerns” under existing rules in the Municipal Code. To pass, the Urgency Ordinance requires four votes from council. Under the proposed ordinance, staff would have a noticing map and be required to notify all residents within 500 feet of the project. While the action would be administrative review, there would be a ten day period that would allow any party to appeal the action to the Planning Commission, which would ultimately allow for the city council to review projects under some conditions. Encourage density by any means necessary, including wider implementation of permit-only parking, making it possible to limit total number of cars allowed per home. Limit shadow impacts as much as possible. Your in favor of encouraging density in the middle of existing neighborhoods (in effect allowing mini-dorms)? “Mini-dorms” is a ridiculous term. Most post-secondary students in most countries are integrated into their cities. The USA is the outlier, at least outside of big cities — and of course community colleges. I bet that there’s a good argument that it helps college students grow up. We need more housing, flexible in design and with an affordability mandate. I’ve lived in dorms, in suburbia, temporarily in a gated community and in one of the densest parts of a Central European city. I prefer the latter enormously and I think that many people would, if given the opportunity. But also codes need to be changed so that there’s a possibility of a coffee shop or similar within a reasonable walk of most homes. Good rules and designs can significantly reduce the need for cars. Programs such as Neighbors’ Night Out – or elements of these – should become more than annual events to encourage everything from casual conversation to neighbor-tutoring. No more than a mega-dorm is silly. The reality is that when you build housing in town, more students ride bikes or take the bus. Drivership is less than 50 percent overall for students, less than 30 percent in town. We would prefer apartments close to campus to cramming into houses off campus – for the most part. I tend to agree with Craig. His comment does spur one follow-up question though. When he says “more students ride bikes or take the bus. Drivership is […] less than 30 percent in town.” does that mean that more than 70% of students in town do not have a car in Davis, or does a portion of the 70% actually have a car, but don’t use it to go to their classes and other campus activities? Good question. According to the UCD travel survey, roughly 40 percent of undergrads report having “access to a vehicle” – I then extrapolated differences in out of town to in town drivership to arrive at my 30 percent estimate. So your 30% means nothing, IOW. It doesn’t mean nothing. It’s an estimate based on several survey results. It’s just not an exact number. Basically we have: number of students with access to a car, ride shares for those living in town versus out of town, based on that, I estimated the number of in-town students with cars at 30 percent. David, the City has “talked the talk” of a commitment to increased density since at least the 2007-2008 Housing Element Steering Committee, but hasn’t done a very good job of “walking the walk.” Todd’s comments aren’t out of line with the, now 11 year commitment to the densification of Davis. The challenge really isn’t whether to deal with densification as a binary yes or no decision, but rather to deal with and mitigate any negative consequences of that densification. One step I strongly support is to establish annual Business License fees for single family residences (SFRs) that are not owner occupied. Specifically, I would establish those annual Business License fees on a sliding scale based on the number of nuclear families residing in each rental SFR. — One nuclear family renting the SFR would result in the base Business License fee. — Two nuclear families renting the SFR would result in an annual Business License fee that is double the Base level. — Three nuclear families renting the SFR would result in an annual Business License fee that is triple the Base level. — Four nuclear families renting the SFR would result in an annual Business License fee that is four-times the Base level. — Five nuclear families renting the SFR would result in an annual Business License fee that is five-times the Base level. And so on. Unless any of the students renting a SFR are siblings, the number of nuclear families in a SFR rented to students would be equal to the number of students living there. Five students renting the SFR would result in an annual Business License fee that is five-times the Base level. The revenue realized from those Business License fees would fund the additional enforcement that Todd has suggested. Where’s the justification for these fees? How high would they be? To be clear, the idea of a building designated for the narrow “family” seems alien to me. I suppose we have to get the term “chosen family” into the Davis lexicon. Enforcement in my parking plan would come from parking fees. Encourage density by any means necessary . . .
All of the above comments have merit, but Davis is still faced with the fundamental issue that UCD historically did not construct on-campus housing on pace with its tremendous growth in student population. It completely failed to meet the housing construction goals in the November 2002 Board of Regents student housing report and also failed to meet the on-campus housing goals in the 2003 LRDP. And, the 2018 LRDP approved by the Regents last year only aims to house 48% of students on campus by the 2030-31 academic year, meaning that 52% (20,280) of the targeted total of 39,000 students expected by then will still be seeking off-campus housing. And, if past events are any indication of the future, UCD’s enrollment will blow past 39,000 well before 2030 and keep on going. One of the outcomes of UCD’s rapid growth and failure to build housing has been the conversion of single-family homes to student housing in many neighborhoods. Such converted homes (whether one chooses to call them mini-dorms or something else) typically have multiple students per bedroom. Thus, a typical 3-bedroom home can easily have 6 or more students residing therein. This results in many problems, which have occurred in my own neighborhood. Those include multiple cars parked at the curb, and even in front yards, late-night loud parties, and drunken behavior (including public urination, backyard beer bottle throwing contests, harassment of neighbors, etc.). As one who has been awakened at 2:00 AM by beer bottles crashing against our house, I am not anxious to have more students living in our neighborhood. Many Davis residents bought their homes years ago expecting to spend their later years continuing to live in a quiet, family-oriented neighborhoods, but have had those aspirations ended by the proliferation of nearby high-density student-occupied homes. I recall that during the city council candidates forum sponsored by the Vanguard in 2016, one of the candidates pointed to an elderly woman in the audience and described how the homes on either side of hers had been converted to “mini-dorms,” resulting in a reduction in her peace and quiet but also a probable reduction in the home’s resale value during her widowhood. I see the Council’s proposed action as helping to reduce the likelihood of such occurrences in the future. Yes, the city should be encouraging higher density to encourage more efficient land use, along with transportation by means other than single-occupancy vehicle. Davis has done a good job of that already; as some have heard me say previously, Davis and Flagstaff have an almost identical population. But, whereas Davis is contained within less than 10 square miles, Flagstaff is spread out over 60 square miles and one sees far fewer bike riders in that city. The problem is that not everyone is willing to adjust their lifestyle to the realities that come with higher density living. As an example, I’ve seen situations in the Cannery where people fill up their garages with belongings that won’t fit inside the house, and so resort to parking in the street. Once street spaces run out, some end up parking on the other side of the street right next to “No Parking” signs. One cannot conclude that all students who live in single family homes will commute to campus by bike, bus or walk. One home in our neighborhood that has been rented to students for many years had a group of student tenants a few years ago who for the most part drove late-model luxury cars (BMW, Mercedes). Those cars moved from their parking spots every morning and returned in the evening, so it’s more than likely the cars were driven to campus. So, I congratulate the Council for listening to the concerns that have been expressed by citizens for many years. The proposed ordinance will achieve something that does not happen now. That is, it will provide public notice to surrounding residents that high density new construction or remodeling is proposed near them, thereby providing an opportunity to decide whether such a proposal will impact them and an opportunity to officially register those concerns with the City. As it is now, there is no public notice and no opportunity to comment before construction starts. I think this is a good and needed form of public disclosure. It does not mean that higher density won’t occur; it simply means that such proposed expansions will be subject to public disclosure and discourse. Note: I am a member of the Davis Planning Commission, but the thoughts expressed above are entirely my own as a private citizen. Davis is still faced with the fundamental issue that UCD historically did not construct on-campus housing on pace with its tremendous growth in student population. Matt: you’re obviously correct. Only difference is that the city, through approved new development, provided housing for its growing population, whereas UCD did not. If memory serves correctly, when we moved to Davis in 1999 UCD had 22,000 students. It increased by 50% to 33,000 just a few years ago. Greg, here are the graph points in a table format. In 2000 UCD had an enrollment just over 25,000. It got to 33,057 in 2013. These are highly variable growth rates. 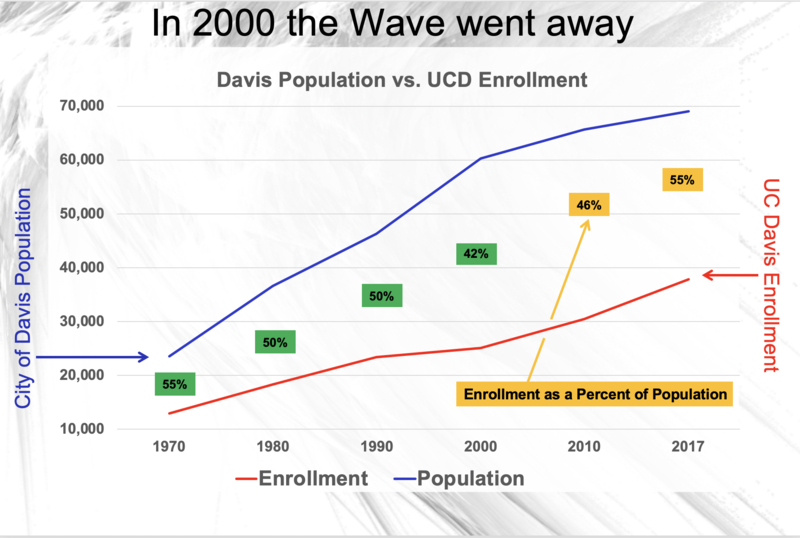 And in the last 7-8 years, UC Davis enrollment growth reached rates that have not been seen since the 1970s, when enrollment was only 1/3 to 1/2 the size that it is now. That’s one way of looking at the data. But another is if you take out the anomalous 90s, you end up with a pretty consistent 2 to 3 percent annual growth rate over the course of nearly 50 years. The city’s growth rate slowed in the last two decades (and stopped in terms of building multi-family market rate housing) and thus failed to do what it had done previously – accommodate UC growth. Matt: One key data comparison for the data is that in terms of absolute numbers, enrollment growth at UC Davis for 2010-2017 was 220% of city of Davis population growth for that same time period, whereas enrollment growth from 1970-1980 was only 41% of city population growth. And before the typical response from David Greenwald that “the City’s growth policies since 2000 have killed population growth!”–we have had this back and forth before–but when you factor in the larger context of U.S., California, and Sacramento region population/housing growth, city of Davis population/housing growth rates actually track very closely to these. The “odd man” out is UC Davis enrollment growth which has ballooned at rates far exceeding growth in Davis, the Sacramento region, California, and the U.S. for the last two decades, and especially in the last 8 years or so. This, combined with UC Davis not adequately providing housing for its students has created large impacts in the Davis rental market. The compound annual growth rate for UCD enrollment for the 47-year period is 2.31%. The individual 10-year periods have fluctuated either side of that 2.31% with a standard deviation of 1.11. At the same time the compound annual growth rate for the City of Davis population for the 47-year period is 2.32%. The individual 10-year periods have also fluctuated either side of that 2.32% but with a significantly higher standard deviation of 1.57. In addition to significantly greater variability, the City of Davis population line has a very clear inflection point in 2000, with the three periods before 2000 coming in above the average, and the two periods after 2000 coming at significantly less than half of the average. Bottom-line, the data clearly shows that Davis significantly changed its behavior during the 47-year period, while UCD did not. Your analysis is like a traffic analysis of only one direction on a two-way street … holding UCD accountable for what you perceive as an egregious increase, while not holding the City accountable for the huge decrease. On an apples to apples basis the UCD 220% you cite should be compared to an even higher 296% decrease by the City since 2000. Matt Williams: you and I have had some good honest discussions about data. But that chart “In 2000 The Wave Went Away” should be Exhibit A for a new edition of “How To Lie With Data Visualization.” It takes all context out of the equation and is a massive distortion of what has actually happened. But you’re making the same mistake of what you are accusing others of. Not only has the city slowed its growth since 2000, but between 2002 until when Sterling opens, it has not approved a single multi-family housing unit that is market rate. So any housing that has been added is either affordable housing (which students don’t normally qualify for) or single family homes. Comparing that growth to university growth is the wrong metric. But your analysis is not even taking that into consideration. UC enrollment growth is a major factor in the housing needs of the communities that host UC campuses. It isn’t just students; when the campus population grows, they add staff and faculty. UC creates demand for single-family housing as well as rental housing in the surrounding communities. Unless one happens to believe that UC should provide 100% of student, staff, and faculty housing, it makes sense that the host communities will need to plan for housing growth that corresponds at least approximately to UC’s growth. The useful growth comparisons for Davis might be with respect to the other communities that house UC campuses, though direct comparisons would be challenging because of the fragmented nature of housing distribution surrounding campuses like UCSD (La Jolla, University City, Del Mar, etc., all provide housing due to UCSD growth, and that campus growth has been explosive). Rik, you do not understand the meaning of “The Wave” To understand it, come to the Wednesday lunch presentation at the International House. Luncheon will be served from 11:45 to 12:00 and the presentation will be from 12:00 to 1:00 after some roundtable introductions. If you, or anyone else who wants to come, plan on coming, drop an e-mail to Richard Yamagata at yamagata@virtual-markets.net so he can be sure there is enough lunch food for everyone. Craig, I hope to see you at International House on Wednesday at lunch as well. It will be a pleasure to meet you. Matt: I understand very clearly that your characterization of UCD enrollment rates is fundamentally mistaken, and that chart does not show what you say it shows. As far as why you doing that, I don’t know. Sorry, I am working during the presentation. I’m happy to provide a critique of the presentation if you care to send it to me. Matt: it is truly bizarre that you claim some sort of “inflection point” in city population growth without looking at the larger context of Sacramento area, California, and U.S. population growth. It’s like you think Davis exists in a vacuum and it should only respond to arbitrary UCD enrollment decisions. And then it is even more bizarre that you look at UCD enrollment growth that steadily declined for 3 decades and then reversed course and dramatically increased for almost two decades and characterize this as “UCD has been growing at the same consistent rate since 1970.” Even the red line in your chart show clear “inflection points,” as you call them. If you want to present the data honestly, before Wednesday produce the following: a chart showing average annual growth rate by decade for UCD enrollment vs. Davis, Sacramento region, California, and U.S. population and housing growth. Rik, you see a Supply/Demand equivalency between University enrollment and total population . . . an equivalency that I do not see. Can you please explain how total population (of any population set) and enrollment in Universities and/or Colleges are linked. I do not see any linkage. Perhaps you can use Venn Diagrams to show where the equivalencies/linkages exist. Matt: for whatever reason, you seem intent on misrepresenting the data that you are showing, as well as ignoring the larger context of the demographic and other trends behind the data. Population growth rates in the region, state, and country have been slowing the past couple of decades because of demographic factors. The city of Davis has mirrored these trends. And growth projections for the future show more of the same with annual rates at less than 1%. At the same time, UCD has dramatically increased enrollment to greater than 3% annually. As well documented, a major factor in this is a large increase in international student enrollment which has been a cash cow for the university, with UCD recently pursuing this strategy more than any other UC system school. Coupled with the lack of provision of housing to accommodate these enrollment increases, what we see then is UCD trying to meet budgetary goals by placing many of the costs of its expansionary policies on the city of Davis. This is the big story of the past two decades that you are missing in favor of a narrative that is is not supported by the data and context. If you want an honest discussion, along with placing city of Davis population and housing growth rates in context with the region, state, and country, you should also place UC Davis enrollment rates in context of other UC system schools, as well as public university enrollment rates across the U.S. Bonus points for breaking out UC Davis enrollment rates by domestic and international students. “Among the nine University of California campuses that enrolls undergraduates, UC Davis admitted the highest number of international students for the upcoming school year, according to admissions data released Thursday. Rik seems bent on analyzing the data without looking at what is happening on the ground. Basically the university has been growing, the city had been growing. The university relied on the city to provide housing in Davis because Davis is cheaper and more available than other UC host towns. The city of Davis stopped growing (nothing to do with statewide trends), the residents basically made it impossible to grow outward. At the same time, the city didn’t approve a market-rate multi-family project until 2017. 15 years. None of this does Rik want to address. He’s rather play with statewide numbers and abstract concepts. He’s got no idea what’s going on on the ground. The planning department is already overburdened with work often forcing extended delays on projects. Why would we want to increase that workload? 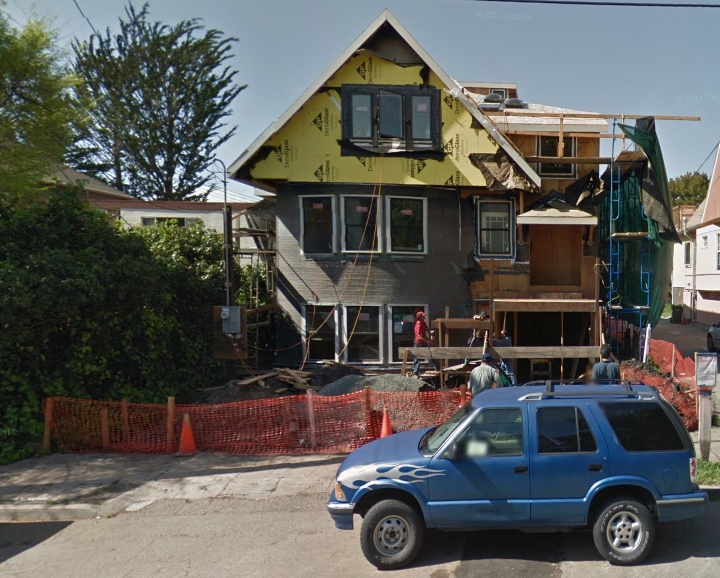 Two story construction should be allowed on all residential properties throughout the city with limited review. Design review should only be considered for structures that are three stories and above. There also is no need to open these projects up to community-wide scrutiny. Only those residents that are directly impacted by a change (living some minimum distance from the property) should be allowed the opportunity to object thus forcing a review by the Planning Commission. Densification of existing neighborhoods is exactly what we should be doing in town, not creating new restrictions and costs. I see your point Mark, but here’s a question: how many are we talking about? There is no data presented here either way. So we really can’t discern: (A) is this a problem and (B) is this a burden on city staff. David – The current market in Davis creates a big incentive to turn SFH’s into rental units and to modify those homes into mini-apartment complexes. The most effective way to reduce those incentives is to build apartments, lots of them. This proposed ordinance will not do that, so it is nothing but a ‘feel good’ effort that will have no impact on the real problem and will likely create new ones. In short, it is a great example of the ‘Davis-way’ of problem solving. I agree with Mark for the most part. Especially the “will likely create new ones” part. Where Mark and I diverge is whether building more apartments will actually reduce the incentives to any meaningful extent … unless there are enough apartment units built to eliminate the 10,000+ bed shortage that exists in Davis currently … and that bed shortage is growing by 1,000 to 1,500 additional beds each year. Fair enough Mark. Fair enough. The current market in Davis creates a big incentive to turn SFH’s into rental units and to modify those homes into mini-apartment complexes. So we really can’t discern: (A) is this a problem… ? Somebody have an axe to grind? We urgently need to appear to be doing something. The only reason I can think of to justify this ordinance. Soooowwwwww, Davis should take out eminent domain on existing SFH neighborhoods and put up apartments for students so that other SFH neighborhoods won’t have “mini-dorms” of students??? Hmmm . . . wonder if the “rich” SFH neighborhoods or the “less rich” SFH neighborhoods will be the actual targets for such densification? My guess is the less rich neighborhoods get the shaft. I don’t think anyone suggested that or are you being facetious again? Who . . . me?